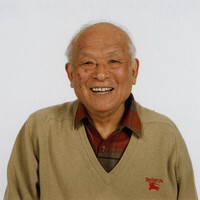 The official Twitter feed of Mizuki Production has announced that the ashes of the late, lamented manga artist Shigeru Mizuki (GeGeGe no Kitarō) have been laid to rest in a tomb of Mizuki's own design. The interment occured on May 29, 2016, approximately six months since Mizuki passed away at the age of 93 on November 30, 2015. The Tweet included a photograph (taken 30 years ago) of Mizuki posing with the tomb, which features carvings of Kitaro and Nezumi-Otoko from GeGeGe no Kitarō. When asked about the tomb during his lifetime, Mizuki praised the carver as "the Michaelangelo of Chōfu". Mizuki also stated that he wanted to design the tomb himself so that he'd be sure he would be comfortable with it when it was his time to enter it.